SKU: 8002-REG. Categories: Shop All ThinLine Products, Horse And Rider Tack. The following instructions will be included with your ThinLine Hoof Pads for horses to give to your farrier. Use of a plastic pad under the ThinLine pad is recommended to keep out sand and stones. Lost Shoe? No worries! Duct tape this hoof pad and you will provide comfort and support until your farrier arrives! Cut a smaller piece of the ThinLine Hoof Pad for horses to fill in frog area, then use double-sided tape or a small amount of dental impression material to attach the frog insert to the shoe and place on the horse’s hoof. Frog inserts will load while the foot is on the ground and relieve when unloaded. Trim the pads to fit and simply place inside boot. Please note that if the hoof boot is loose on your horses hoof, this will greatly increase the wear on your hoof pad. Place the slick side of the hoof pad against the other pad and keep the matte side against the horse’s hoof. For optimal results, replace pads at regular shoeing intervals. Use double-sided tape (ex. carpet tape) and stack the ThinLine Hoof Pads at the heel. Q Are they sold in pairs? A Yes, they are sold in pairs. Q Hi. I am looking for a rim pad that is shock absorbent. Would you say that I could use this product for that purpose? A Thank you for your question! 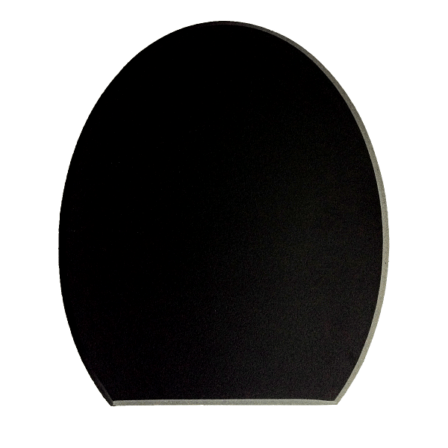 These pads are made of ThinLine performance foam and absorb about 95% of shock and impact. The instructions for use as rim pads are on the product page above. Please call us at 888-401-9101 if we can be of further help! A Thank you for your question! You've found what you're looking for! These pads are designed to be used between your horse's hoof and shoe. Q What is the general lifespan of a set of hoof pads? A Thank you for your question! It is recommended to replace the pads at regular shoeing intervals to give your horse the maximum benefit. It is possible that they could be reused for a second shoeing cycle, depending on the conditions. Q Do they come as a pair? A Thank you for your question! The hoof pads come in pairs. Q How thick are they? A Thanks for your question! These therapeutic hoof pads are made of ThinLine Plus performance foam, which is 1/4" thick.